Cities: Capital: Caracas (metro. area pop. 3.2 million). 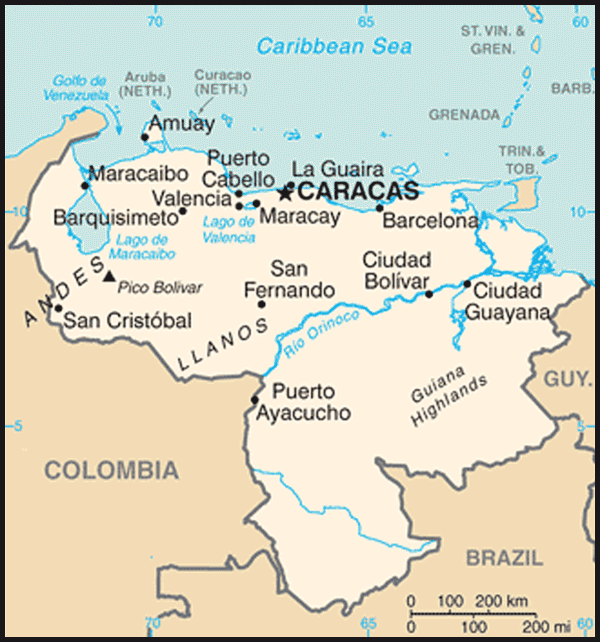 Other major cities — Maracaibo, Valencia, Barquisimeto, Maracay, Merida, Ciudad Bolivar. Nationality: Noun and adjective — Venezuelan(s). Population (August 2011 est. ): 29,335,489. Education: Years compulsory: 9. Literacy (2009) — 98.7%. Health: Infant mortality rate (2008): 16 deaths/1,000 live births. Life expectancy (2009) — 73.94 years. Branches: Executive: President (head of government and chief of state; 6-year term); Council of Ministers (cabinet, appointed by president). Legislative — unicameral National Assembly (5-year term). Judicial — 32-member Supreme Court (elected by National Assembly; 12-year term). Electoral — National Electoral Council (elected by National Assembly; 7-year term). Citizen Power — Prosecutor General, Public Defender, Comptroller General (elected by National Assembly; 7-year term). Major political parties: United Socialist Party of Venezuela (PSUV), Communist Party of Venezuela (PCV), Democratic Action or Accion Democratica (AD), Christian Democrats or Comite Organizador Politico por Elecciones Independientes (COPEI), Fatherland for All or Patria Para Todos (PPT), Movement to Socialism or Movimiento al Socialismo (MAS), Radical Cause or La Causa Radical, First Justice or Primero Justicia, the National Convergence or Convergencia, For Social Democracy or Podemos, A New Time or Un Nuevo Tiempo (UNT), Project Venezuela, and Popular Will or Voluntad Popular (VP). Principal government officials: See listing (http://www.state.gov/r/pa/ei/bgn/35766.htm#govtoffs) under History and Political Conditions section. Manufacturing (15.2% of 2009 GDP in constant 2007 dollars): Types — iron and steel products, paper products, aluminum, textiles, transport equipment, consumer products. Agriculture (4% of GDP): Products: corn, sorghum, rice, bananas, vegetables, coffee, beef, pork, poultry, milk, eggs, fish. Trade: Exports (2009): $60.9 billion: petroleum ($57.6 billion), aluminum, steel, chemical products, iron ore, cigarettes, plastics, fish, cement, and paper products. Major markets (2005) — U.S. 57.5%, the Netherlands 5.2%, Mexico 4.5%, Colombia 4.5%. Imports (2009) — $38.5 billion: consumer goods, machinery and transport equipment, manufactured goods, construction materials. Major suppliers (Jan.-Oct. 2009) — U.S. 27.0%, Colombia 12.6%, China 10.2%, Brazil 8.2%. Exchange rate (2010): On December 30, 2010, the official exchange rate was set at 4.3 bolivares=U.S. $1. The alternative exchange rate under the so-called SITME system, a bond-swap mechanism established under the supervision of the Central Bank, has averaged 5.3 bolivares=U.S. $1 since June 2010. An estimated 29 million people lived in Venezuela as of 2011. The population growth rate is 1.6% per year, and roughly 47% of Venezuelans are under the age of 25. 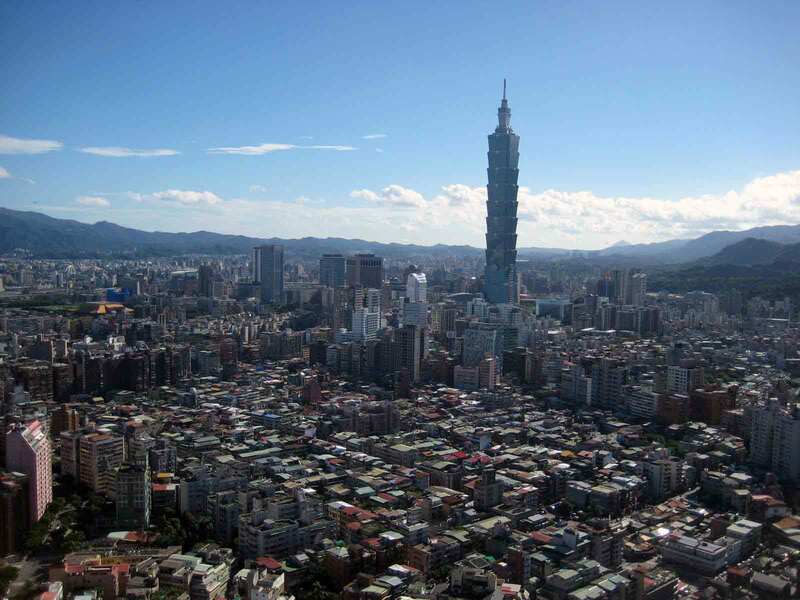 According to the 2001 census, almost 90% of the population lives in urban areas. Metropolitan Caracas, the country's largest city, has an estimated 3.2 million inhabitants. Venezuela is proud of its tradition as a melting pot, and the majority of its citizens have a mixed racial heritage of Caucasian, African, and American Indian elements. At the time of Spanish discovery, the natives in Venezuela were mainly agriculturists and hunters living in groups along the coast, the Andean mountain range, and the Orinoco River. Venezuela was a relatively neglected colony in the 1500s and 1600s as the Spaniards focused on extracting gold and silver from other areas of the Americas. Toward the end of the 18th century, the Venezuelans began to grow restive under colonial control. In 1821, after several unsuccessful uprisings, the country achieved independence from Spain under the leadership of Simon Bolivar. 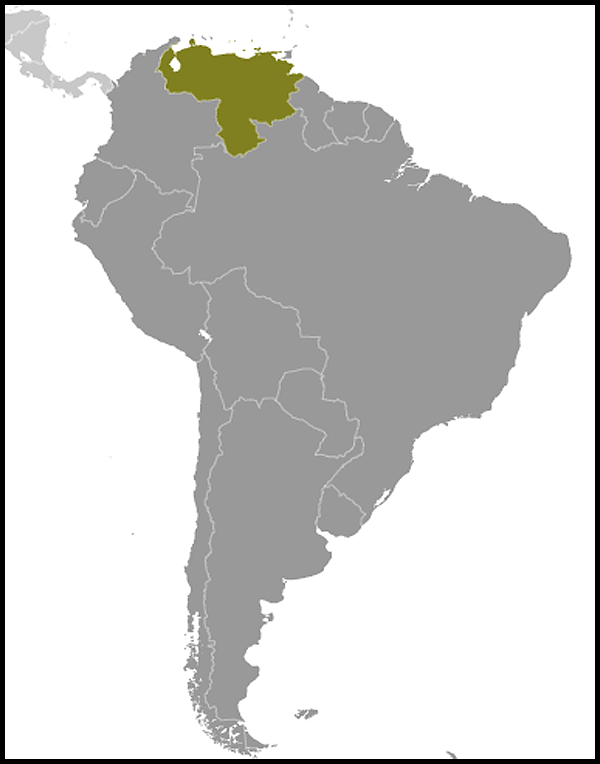 Venezuela, along with what are now Colombia, Panama, and Ecuador, was part of the Republic of Gran Colombia until 1830, when Venezuela separated and became a separate sovereign country. Much of Venezuela's 19th-century history was characterized by periods of political instability, dictatorial rule, and revolutionary turbulence. The first half of the 20th century was marked by periods of authoritarianism — including dictatorships from 1908-35 and from 1950-58. In addition, the Venezuelan economy shifted after the First World War from a primarily agricultural orientation to an economy centered on petroleum production and export. Since the overthrow of Gen. Marcos Perez Jimenez in 1958 and the military's withdrawal from direct involvement in national politics, Venezuela has enjoyed an unbroken tradition of civilian elected governments. Until the 1998 elections, the Democratic Action (AD) and the Christian Democratic (COPEI) parties dominated the political environment at both the state and federal level. Venezuela's prevailing political calm came to an end in 1989, when Venezuela experienced riots in which 200 people were reportedly killed in Caracas. The so-called "Caracazo" was a response to an economic austerity program launched by then-President Carlos Andres Perez. Three years later, in February 1992, a group of army officers led by then-Lt. Col. Hugo Chavez mounted an unsuccessful coup attempt, claiming that the events of 1989 showed that the political system no longer served the interests of the people. Chavez was convicted of rebellion and jailed for his role in the coup, but was released in 1994. A second unsuccessful coup attempt by other officers affiliated with Chavez followed in November 1992, while Chavez remained in jail. A year later, Congress impeached Perez on corruption charges. President Chavez also had campaigned for the election of a National Constituent Assembly to write a new constitution. The National Constituent Assembly (ANC) convened in August 1999 to begin rewriting the constitution. Venezuelans approved the ANC's draft in a national referendum on December 15, 1999. The political system described below is that defined by the 1999 constitution. The National Assembly is unicameral. Deputies serve 5-year terms, and may be re-elected indefinitely. These legislators are elected by a combination of party list and single member constituencies. When the National Assembly is not in session, a delegated committee acts on matters relating to the executive and in oversight functions. In December 2005 pro-government parties took all 167 seats in the National Assembly after opposition parties boycotted the election over concerns about electoral conditions. The constitution designates three additional branches of the federal government — the judicial, citizen, and electoral branches. The judicial branch is headed by the Supreme Court (TSJ), which may meet either in specialized chambers (of which there are six) or in plenary session. The National Assembly elects justices, who serve 12-year terms. Under the 1999 constitution, the TSJ was composed of 20 justices. The 1999 constitution was amended in 2004, and the number of justices was expanded to a total of 32. The judicial branch also consists of lower courts, including district courts, municipal courts, and courts of first instance. The citizens branch consists of three components — the prosecutor general ("fiscal general"), the "public defender," and the comptroller general. The holders of these offices, in addition to fulfilling their specific functions, also act collectively as the "Republican Moral Council" (RMC). The RMC challenges actions they believe are illegal before the Supreme Court, particularly those which violate the constitution. The leadership of the RMC rotates among the three officials for 1-year periods. The holders of the "citizen power" offices are selected for terms of 7 years by the National Assembly. The "Electoral Power," otherwise known as the National Electoral Council (Consejo Nacional Electoral or CNE), is responsible for organizing elections at all levels. Its five members are also elected to 7-year terms by the National Assembly. In the event of a hung vote in the National Assembly, the Supreme Court can be called on to appoint the members. For a recall to occur, the promoters must obtain signatures for 20% of all registered voters. Preparations for the recall were delayed by the lack of a quorum in the National Electoral Council. In September 2003, after an impasse in the National Assembly, the Supreme Court resolved the issue by naming a new CNE board of directors. After months of intense deliberations that included two conflicting signature drives overseen by the CNE, deep disagreements and occasional violence over the CNE's disqualification of signatures on the petition, and the intervention of international electoral observers, the CNE certified that the opposition had obtained sufficient signatures to trigger the vote mechanism and set the date of the recall referendum for August 15, 2004. According to the CNE, President Chavez won 59% of the vote. His opponents immediately claimed electoral fraud. However, international electoral observation missions carried out by the Organization of American States and the Carter Center found no indication of systemic fraud. In the wake of the referendum victory, pro-Chavez candidates continued to sweep other electoral contests. Chavez supporters won 20 out of the total 22 state governorships up for election in October 2004. Chavez supporters also won a majority of the seats in the August 2005 municipal council elections. Pro-Chavez parties won all 167 seats in the December 2005 National Assembly elections, after most opposition candidates boycotted the elections over voter secrecy concerns. The final reports of the European Union (EU) and OAS observer missions to the 2005 legislative elections, which were marked by record-high abstention, noted high levels of distrust in electoral institutions. The reports made specific recommendations to increase transparency and help voters regain the confidence necessary for participation. Most recommendations were not implemented. In January 2007, President Chavez announced a renewed effort to implement his vision of "21st Century Socialism" in Venezuela. He asked the National Assembly to grant him special constitutional powers via an "enabling law" to rule by decree with respect to a broad range of issues. The all pro-government National Assembly granted those powers, for a period of 18 months. Chavez used that authority to take major steps to nationalize the telecommunications and electricity sectors, as well as to finalize a majority government share in many oil projects, all sectors with significant foreign investments. In legislative elections held on September 26, 2010, Chavez's United Socialist Party of Venezuela (PSUV) party won 98 seats, the opposition's Democratic Unity Table (MUD) 65 seats, and the "third way" Fatherland for All (PPT) party 2 seats. Debate continues over the national popular vote, with Chavez claiming the PSUV won a majority (by 100,000 votes) and the opposition claiming a 52% majority when all non-PSUV parties are counted together. Following the September 26 elections, the PSUV moved quickly to accelerate implementation of President Chavez's "Bolivarian Revolution" in advance of the January 5, 2011 convening of the new National Assembly. In addition to appointing nine Chavez loyalists to the TSJ, PSUV deputies approved a series of laws aimed at creating a "communal" state and economy; limiting internal rules for assembly debate; prohibiting party defections; and increasing government control over the independent media, Internet, banks, and non-governmental organizations (NGOs). It also approved a fourth "enabling law" granting President Chavez decree powers for 18 months, effectively marginalizing the legislative power of the newly-elected opposition deputies. Nearly all notable legislation enacted since January 2011 has been through presidential decree. In the first half of 2011, President Chavez issued decree laws that authorized the government takeover of "idle or underutilized" land and buildings in "emergency zones, " imposed a windfall profits tax on oil sales over $40 per barrel, and required all companies to provide food ticket benefits to employees, A decree law on "fair costs and prices," allegedly intended to price gouging, extends significant government controls over private sector enterprises. As of mid-2011, the CNE had not announced the dates for the presidential, gubernatorial, and local elections that should be held in 2012. The constitution establishes January 10 as the date for presidential inaugurations, but does not set election dates. Despite his cancer diagnosis in June 2011, President Chavez said he would be his party's candidate. The opposition's "Unity Table" (MUD) announced in April that a single opposition presidential candidate would be selected through a primary election on February 12, 2012. The Venezuelan embassy (http://venezuela-us.org/) in the United States is located at 1099 30th St. NW, Washington, DC 20007 (tel. (202) 342-2214). In addition to Washington, DC, Venezuela maintains consulates in Boston, Chicago, Houston, Miami, New Orleans, New York, San Francisco, and Puerto Rico. The Venezuelan Government dominates the economy. There is considerable income inequality. The Gini coefficient was 0.39 in the second half of 2009. According to government statistics, the percentages of poor and extremely poor among Venezuelan households were 23.8% and 5.9%, respectively, in the second half of 2009. Real GDP contracted 3.3% in 2009, indicating a decrease in government expenditures and private consumption as a result of a drop in oil prices. The economic contraction continued in 2010 when real GDP decreased by 3.5% during the period January-June 2010 compared with the same period of 2009. The Consumer Price Index increased by 27.9% from September 2009 to September 2010, following increases of 25.1% in 2009, 30.9% in 2008, and 22.5% in 2007. The state oil company, PDVSA, controls the petroleum sector. Government companies control the electricity sector and important parts of the telecommunications and media sectors. In 2008, the government nationalized cement and steel producers, as well as select companies in the milk and meat distribution sectors. In 2009 it nationalized assets in the oil (including assets owned by U.S. oil services companies), chemicals, tourism, agribusiness (including a processed rice plant owned by a U.S. company), retail, and banking industries. In 2010, the government nationalized companies in the agricultural and construction sectors as well as U.S. assets in the petrochemical and packaging industries. A number of U.S. companies whose assets have been nationalized in Venezuela have chosen to pursue their claims through international arbitration. Threats of continuing nationalizations, as well as other threats to property rights and an uncertain macroeconomic environment characterized by high inflation and foreign exchange controls, have led to reduced space for the private sector and low levels of private investment. All requests for foreign exchange at the official exchange rate must be approved by the National Exchange Control Administration (CADIVI), and the Central Bank (BCV) completes all legal purchase and sale of foreign currency. On December 30, 2010 the government set the official exchange rate at 4.3 bolivares per dollar. An alternative exchange market, called the Transaction System for Foreign Exchange Denominated Securities (SITME), is accessed through authorized Venezuelan financial institutions and operates by means of a bond-swap mechanism through the Central Bank. The SITME exchange rate has averaged 5.3 bolivares=U.S. $1 since transactions began in June 2010. Any other foreign exchange transactions are not legally permitted, although a black market is reported to exist. Central Bank international reserves were U.S. $29.4 billion at the end of September 2010. On August 17, 2011, President Chavez announced his government's decision to relocate all of Venezuela's international reserves that were deposited in U.S. and European financial institutions. This included 211 tons of gold reserves to be transferred to the Central Bank of Venezuela and $6.28 billion in cash reserves to be transferred to banks in Brazil, China, and Russia. In early 2005, the government informed companies with operating service contracts for mature fields that they must migrate the contracts to joint ventures that conform to the 2001 Hydrocarbons Law. The government threatened to seize fields operating under the services contracts on December 31, 2005 if oil companies did not sign transition agreements to migrate their contracts. All but three companies ultimately signed joint venture agreements with the government. One company was bought out by its partner, while the fields operated by two other companies were ultimately taken over by the government. These disputes were handled by negotiation. In early 2007, President Chavez announced that the Venezuelan Government would take a majority government share in the remaining foreign investments in the oil sector, including the four heavy-oil "strategic associations" in the Orinoco belt. Several international oil companies agreed to migrate their interests to joint ventures with majority government ownership. Two U.S. companies decided to pull out of Venezuela and filed for international arbitration. In May 2009, the National Assembly passed an oil services sector law reserving to the state all primary hydrocarbons activity. This legislation laid the foundation for the expropriation of nearly 80 oil services companies, including three U.S. firms. The National Assembly in June 2009 passed legislation to require private-sector petrochemicals producers to enter joint ventures with Petroquimica de Venezuela (Pequiven, the state chemicals company), affecting many foreign companies operating in Venezuela. Agriculture accounts for approximately 4% of GDP, 10% of the labor force, and at least one-fourth of Venezuela's land area. Venezuela exports cigarettes, fish (primarily domestically raised crab and shrimp), tropical fruits, cocoa, and manufactured products. The country is not self-sufficient in most areas of agriculture. Venezuela imports about two-thirds of its food needs. In 2009, U.S. firms exported $967 million worth of agricultural products, including wheat, corn, soybeans, soybean meal, cotton, animal fats, vegetable oils, fruits, nuts, dairy products, processed fruits and vegetables, and other items to make Venezuela one of the top two U.S. markets in South America. The United States supplies roughly one-quarter of Venezuela's food imports. Official statistics registered 6.6% unemployment at year-end 2009, although such figures do not account for workers in the informal sector of the economy, who constitute approximately half of the country's total workforce. The public sector employs about 20% of the workforce. Only 12% of workers are unionized. Of those employed, a significant proportion work in the "informal" sector. Labor unions allege the government repeatedly violates International Labor Organization (ILO) agreements on freedom of association and the right to organize and bargain collectively. Specifically, the constitution and laws permit undue influence in the internal elections of unions. The government has told the ILO it would correct the problem; draft legislation remains pending in the National Assembly. Venezuela has an extensive road system. With the exception of air service, transportation has failed to keep pace with the country's needs. Much of the infrastructure suffers from inadequate maintenance. Caracas has a modern subway but only one functioning rail line serves the rest of the country. Venezuela's ports, recently nationalized, do not currently match the country's status as a trader. Venezuela's importers and exporters complain of delays and high costs. President Chavez has promoted his "Bolivarian Revolution" as a model for other countries to follow. The policy calls for the establishment of a "multi-polar" world, the end of alleged U.S. hegemony, and greater integration among developing countries. Venezuela supports regional integration through its PetroCaribe and PetroSur petroleum initiatives, the further institutionalization of the South American Community of Nations (UNASUR), the establishment of a new Community of Latin American and Caribbean States (CELAC), and the Bolivarian Alliance for the Americas (ALBA, a political, economic, and social integration project proposed by President Chavez as an alternative to the Free Trade Area of the Americas). In April 2006, President Chavez announced he was withdrawing Venezuela from the Andean Community trade bloc (CAN). In July 2006, Venezuela officially joined the Southern Common Market, MERCOSUR. Before it can become a full member of MERCOSUR, Venezuela must conform to the trade bloc's economic regulations. Congressional approval by Paraguay is also still outstanding. The Venezuelan Government maintains very close relations with Cuba. The Venezuelan Government broke diplomatic relations with Colombia after a July 22, 2010 special session of the OAS Permanent Council in which Colombia charged that the Venezuelan Government was permitting members of the Revolutionary Armed Forces of Colombia (FARC) and the National Liberation Army (ELN) to use Venezuelan territory to rest and regroup, engage in narcotics trafficking, and extort protection money and kidnap Venezuelans to finance their operations. On August 10, 2010, newly-inaugurated Colombian President Juan Manual Santos and President Chavez met in Santa Marta, Colombia, and announced the restoration of diplomatic relations, including the establishment of a bilateral commission with five working groups, including one on security. Since then, there have been ministerial-level meetings to discuss bilateral commercial and security issues. On November 19, 2010, Venezuelan Minister of Interior and Justice Tarek El Aissami and Colombian Defense Minister Rodrigo Rivera publicly announced their intention to begin bilateral cooperation to combat narcotrafficking and said a bilateral agreement reflecting this commitment would be signed at a summit meeting in February 2011. Following a December 2010 ministerial-level meeting, the Venezuelan Government announced that it would share real-time information on drug trafficking routes with the Colombian Government. Since the reestablishment of bilateral relations, the two governments have exchanged several high-profile narcotraffickers and FARC leaders. On April 25, Venezuela deported FARC leader Joaquin Perez Becerra to Colombia, and on May 31, announced the capture of another FARC leader, Guillermo Torres Cueter (aka Juan Conrado). On May 9, 2011, Colombia extradited alleged drug kingpin Walid Makled Garcia to Venezuela to stand trial. U.S.-Venezuelan relations have been tense in recent years, although both nations agreed at the April 2009 Summit of the Americas in Trinidad to seek a relationship based on mutual interest. President Chavez continues to define himself in opposition to the United States, using incendiary rhetoric to insult the U.S. Government and U.S. influence in Latin America. President Chavez ordered the expulsion of the U.S. Ambassador on September 11, 2008 in solidarity with the Bolivian Government's decision to expel the U.S. Ambassador in La Paz. The U.S. Government ordered the reciprocal expulsion of the Venezuelan Ambassador in Washington. Venezuela and the U.S. returned the ambassadors to their posts in June and July 2009, respectively, after an unusual agreement by each country to declare without effect the "persona non grata" designations. On December 20, 2010 the Venezuelan Government revoked agrement for Ambassador-designate Larry Palmer, which had been issued in May, and on December 27, the United States revoked the diplomatic visa of Ambassador Bernardo Alvarez. Notwithstanding tensions in the bilateral relationship, the United States continues to seek constructive engagement with the Venezuelan Government, focusing on areas where cooperation is in both nations' interest. Examples of such overlapping interests include cooperation in confronting narcotics trafficking and terrorism, as well as the commercial relationship. In May 2011, the Secretary of State decided to impose sanctions on PDVSA for delivering at least three cargoes of reformate, a blending component for gasoline, to Iran between December 2010 and March 2011. The sanctions were imposed under the Iran Sanctions Act of 1996, as amended by the Comprehensive Iran Sanctions, Accountability, and Divestment Act (CISADA) of 2010. They prohibit PDVSA from competing for U.S. Government contracts, securing financing from the Export-Import Bank of the United States, and obtaining export licenses.